Six in ten Americans support Trump's travel ban, according to a new poll from Politico/Morning Consult. Asked whether they support or oppose the State Department’s “new guidelines which say visa applicants from six predominately Muslim countries must prove a close family relationship with a U.S. resident in order to enter the country,” 60 percent of respondents said they support the guidelines, and only 28 percent oppose them. The POLITICO/Morning Consult question doesn’t mention Trump, nor does it refer to the president’s executive orders on immigration. That contrasts with other polls, which mostly show greater opposition to the policy. An Associated Press-NORC Center poll last month showed a 57 percent majority of Americans thought courts were acting rightly in blocking the travel ban. That was conducted before the Supreme Court’s per curiam decision last week to let some elements of the ban go into effect while the high court waits to hear the case in the fall. 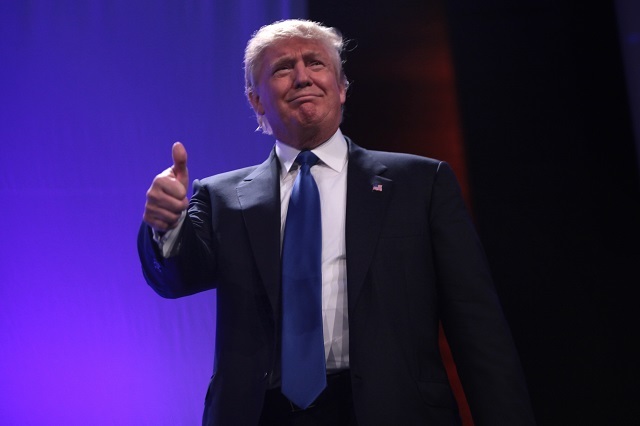 Republicans overwhelmingly back the restrictions, the poll shows. Eighty-four percent of GOP respondents support the ban, while 9 percent oppose it. But the policy is also popular among independent respondents: 56 percent support it, compared with 30 percent who oppose it. Democrats tilt slightly against the ban, with 41 percent supporting it, and 46 percent in opposition. The wording of the poll question in the new survey differs from that in a March poll, after Trump signed a revised executive order in an effort to comply with lower-court rulings against the initial ban. In March, respondents were asked whether they "approve or disapprove of a revised executive order that prohibits persons from six predominantly Muslim countries without visas from entering the United States for 90 days and halting the processing of refugees for 120 days." Then, 56 percent of voters approved of the order, and 33 percent disapproved. "Since we last asked about Trump's travel ban, we've seen a drop in those who oppose the executive order," said Kyle Dropp, Morning Consult chief research officer and co-founder. "Though, we've also seen an uptick in those who do not have any opinion on the matter or have yet to settle on one." The wording doesn't matter. 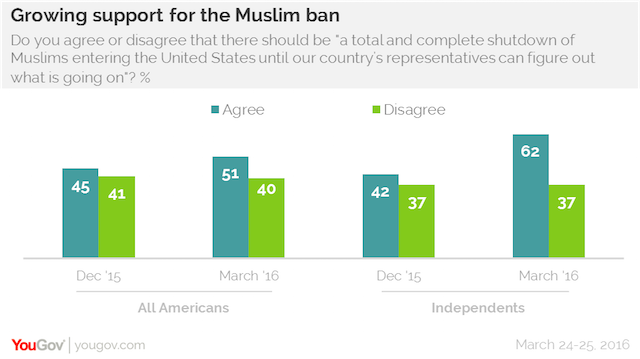 Last year, they asked if people supported a full-on Muslim ban and the majority overwhelmingly said yes.